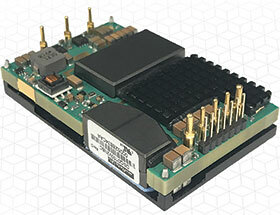 Murata has launched a series of 600 W, DOSA compliant, 12 V output, digital quarter-brick DC-DC converters from Murata Power Solutions. The series was designed for high-reliability applications based on a 32-bit ARM processor that supports the latest PMBus commands for digital control and telemetry functions. The DSQ, DCQ and DAQ converters support the full ‘TNV’ input range of 36 – 75 V, with a typical efficiency of 96% at full-load with 48 V input. The series is designed to support droop mode current sharing of multiple modules for increased power output with tight load sharing. I/O isolation is 2250 V d.c., with a functional insulation system, and it carries the UL/CSA safety agency approvals. Options for these modules include a digital interface supporting the latest PMBus command set, parallel load sharing, positive or negative on/off logic, along with options for standard ‘analog’ DOSA pinout and a 5-pin bus converter pinout. Application examples include telecommunications networking equipment, computing equipment, wireless base stations, PoE systems, MicroTCA, fan trays and test equipment. The DSQ model includes a PMBus interface that provides a means (through an I²C bus) to configure output voltage, soft start parameters, input and output over-voltage protection limits, input under-voltage lockout, current limit and thermal shutdown. Telemetry functions include output voltage and current, input voltage and temperature, as well as indications for ‘power good’ and on/off status. The heart of the module is a 32-bit processor controlling all functions and parameters. To support the PMBus, Murata Power Solutions is offering an optional evaluation board that is supported by downloadable software with a user-friendly GUI. The evaluation boards and a GUI manual are available upon request.